Despite the global economic meltdown, German car maker Porsche plans to sell 50 units of its premium luxury sedan Panamera, which is to be launched by October, in India this year. The Panamera range of luxury sedan cars in the range of Rs 1.4 crore (Rs 14 million) to Rs 2 crore (Rs 20 million) would be launched by October 3. However, bookings for 13 cars had been completed in India, Rod Wallace, Managing Director of Precision Cars India, official importer of the Porsche range of cars, told PTI in Chennai. The company, which sells the popular SUV Cayenne in the country, has sold around 650 cars since its entry into India three years ago. However, 65 per cent of the sales came from the 'Cayenne', he said. "In 2007, we sold around 168 units while in 2008 it was 150. 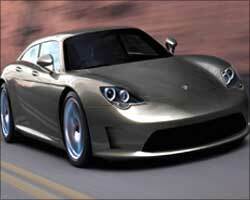 However, with the Panamera we are hoping to reach 225 over the next 12 month period", he said. He said the company had set up a new plant in Germany exclusively to manufacture about 20,000 units of the Panamera range of cars. Total production at its German plant has declined from 98,000 units (in 2008) to 80,000 units this year due to the recession, he said. Indian operations contribute only a meagre percentage of global sales while the US, Europe, China and West Asia are the 'big' markets, he said. To a query, Wallace said Mumbai was the biggest market for the company, with 60 per cent of sales coming from there, followed by Delhi with 30 per cent, while the remaining 10 per cent came from the rest of the country. The company currently has two dealers each in New Delhi and Mumbai. It would be opening three more dealerships each in Chennai, Hyderabad and Cochin. The Hyderabad and Cochin dealerships would be set up on 14,000 square feet, while the Chennai one would be on 11,000 sq ft.